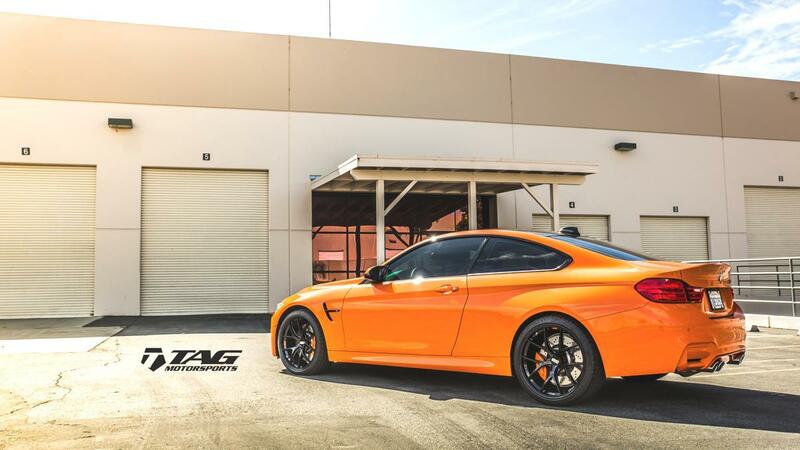 Eye popping, that’s what first comes to mind when you glance at this gorgeous Fire Orange finished BMW M4! This is a build done by TAG Motorsports and features several cosmetic and performance upgrades applied to this incredibly tasty looking bright orange M4. The Fire Orange M4 combines an exciting exterior finish together with an incredibly fast and agile two door coupe, all in one package. The owner of this vehicle approached TAG Motorsports with the desire to further underline the visual aspects of his vehicle. There are several new additions on the visual part (interior and exterior) combined together with advanced customization done to its suspension and braking system. Key to everything was to keep the Fire Orange as the main theme of the build, while loosing weight and upgrading its performance. First order of business was to work on the interior visual mods. So the tuning shop customized the seat backs, shifter bezels, steering wheel inserts, door trim, and such, all in carbon fiber. This customer wanted to keep the interior as simple as possible and opted to have the dash trim painted in Fire Orange. Next, the brake system was visually upgraded. It involved repainting them in the same Fire Orange finish as the exterior, not an easy task to do! The brakes had to be disassembled and repainted, together with the M logos applied once again. Next in line was a set of BBS wheels. While just adding the wheels, lowering the car and calling it a day might be what some would do, in this instance, the wheels were further customized as well. 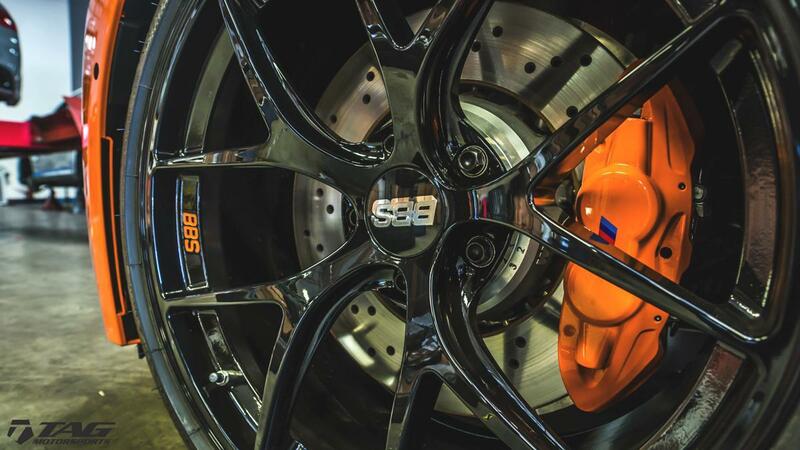 A custom BBS lettering on the wheels’ outer barrel was applied, featuring the same Fire Orange color. Those tiny details sometimes can make a huge difference. 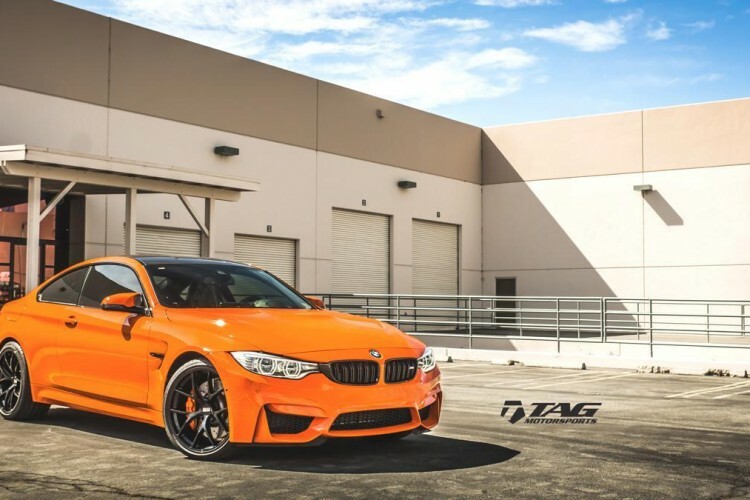 The folks over at Grubbs Photography shared with us some photos of this M4 Fire Orange Project.